The message is clear. With the Union elections only a few months away, the Centre should prioritise capital investments over populist subsidies to deliver on its promise of strengthening the farm sector. This is important, especially when the Punjab and Haryana High Court on September 18 pulled up the Punjab government for granting subsidy on agricultural pump set power connections to farmers, both, rich and poor. The court was responding to a PIL seeking exclusion of rich farmers in Punjab from the purview of free power for agricultural pump sets. Interestingly, a draft Punjab State Agriculture Policy prepared by the Punjab State Farmers & Farm Workers Commission says rationalising power subsidy will reduce unsustainable use of groundwater and support marginal farmers. The draft policy is likely to be tabled in the forthcoming Vidhan Sabha session. The draft proposes rationalising the power subsidy and strictly restricting it for the non-income tax payee farmers. Initially, it proposes levying a fat rate on power at the rate of Rs.100 per Break Horse Power (BHP) per month for the farmer owning 4 hectares of land or more, to be utilised for the welfare of small, marginal and landless farmers. 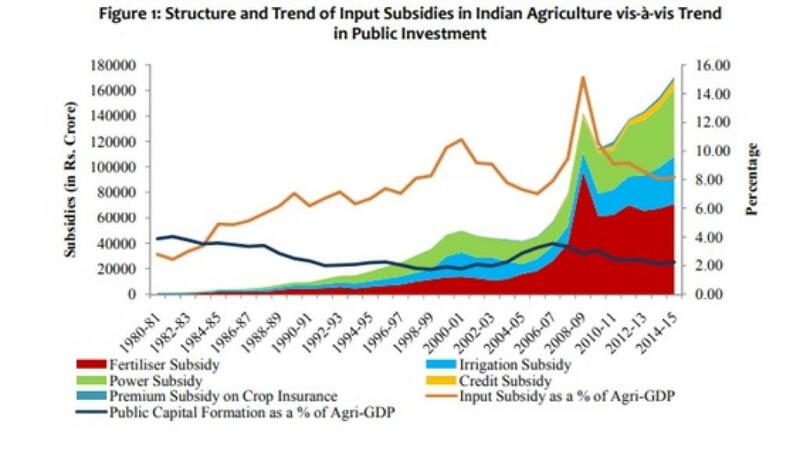 Subsequently, consider rationing the power subsidy to a financial cap for such farmers, says the policy. The agriculture sector in India seems to be more dependent on input subsidies, but subsidy-driven agriculture systems are not sustainable says the Dalwai Committee on doubling farmers’ income. The availability of cheap power has led to irrational use of the groundwater says the panel in its report and calls for rationalising the use of subsidies for needy farmers. For example, subsidised electricity in states like Punjab and Haryana has led to assured incomes, but also to groundwater depletion, income inequality, and unsustainable agriculture. It criticised the support through subsidies which favoured limited crops like wheat and rice and thus benefitting the largely irrigated areas. It called for covering the support to a larger number of crops, sub-sectors, geographies, rain-fed & irrigation systems and farmers. Resonating with the Dalwai Committee’s views on subsidy-driven agricultural sector is a new book, “Supporting Indian Farms the Smart Way” published by ICRIER and released on September 18 by Arun Jaitley, the Union Minister of Finance. Jaitley said at the launch, “Benefits from populist policies are short-lived and subsidies alone can’t sustain a sector for long, unless ‘blended’ with investments”. The book says that public investments in agriculture as a percentage of agricultural GDP has declined from 3.9 per cent in 1980-81 to 2.2 per cent in 2014-15, while input subsidies as a percentage of agricultural GDP have increased from 2.8 per cent to around 8 per cent over the same period. The government-appointed Dalwai Committee on doubling farmers’ income suggests that money saved by rationalising subsidies may be reserved exclusively for the agriculture sector. This could then be added to the yearly normal budgetary allocations for enhancing capital investments for basic infrastructure like irrigation, power, roads, communication, post-harvest agri-logistics, markets and the like. The ICRIER book also uses an interesting model to show that every rupee spent on agricultural research and development yields better returns (11.2), compared to returns on every rupee spent on fertiliser subsidy (0.88), power subsidy (0.79), education (0.97) or on roads (1.10). According to the ICRIER model, if public money is spent on agriculture research and development, and building roads, instead of being spent as subsidies on fertilisers, power or irrigation, marginal returns in terms of number of people brought out of income poverty or higher agri-GDP growth is expected to be almost 5 to 10 times more. For example, for every million rupees spent on agricultural research, 328 people are pulled out of poverty. In contrast, the same amount spent on power subsidies brings only 23 people out of poverty.